Barstool with oak board seat and backrest and 4-legged solid beech wood base. Optional upholstered seat pad or upholstered shell pad. 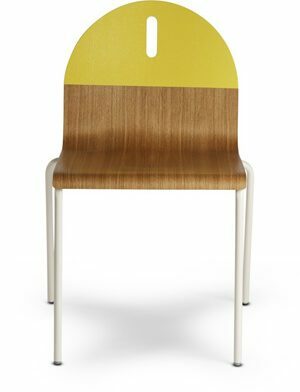 Lineal is a collection of stackable side chairs, armchairs, bar and counter height stools with upholstered seats made from curved plywood and metal or wood bases. The elegance of its lines allows the piece to be integrated into any environment. The designs forms have been reduced to the minimum elements, highlighting its formal synthesis. Its full meaning and function are clearly reflected in its name: a line that extends from its backrest to the seat and balanced by the high precision metal or wood base.